Scientific literature is filled with research regarding the stomach contents of crocodilians. 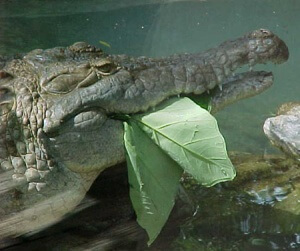 Almost all of them refer to the plant material found in the animals’ stomachs as either an accident (i.e., the crocodilian got leaves in its mouth while trying to swallow a prey item), or secondary (i.e., the crocodilian swallowed a prey item that had grass or leaves it its stomach). One such article lists plants as a “nonfood item”, but notes that the plants were found in ninety percent of the animals sampled. In the summer of 2000, some of our keepers said that they had been seeing American alligators eating fruit from the elderberry plants in the Swamp exhibit. Of course I wanted to blame this on the fact that the alligator must have seen an anole or some other animal in the plants and lunged for it. The keepers were fairly persistent, saying that the alligator had gotten a mouth full of elderberry, swallowed, and then gone back for more. Reports of the alligators eating elderberry, as well as wild grape, from plants in the Swamp exhibit happened several more times that year and have continued over the following years. In May of 2001, we began a mixed species exhibit which includes: American alligators, Chinese alligators(Alligator sinensis), brown caiman (Caiman crocodilus), dwarf caiman (Paleosuchus palpebrosus), dwarf crocodiles (Osteolaemus tetraspis), mugger crocodiles (Crocodylus palustris), and red-foot tortoises,(Geochelone carbonaria). The keepers reported observing American and Chinese alligators eating out of the tortoises’ dishes. Again, I was inclined to explain this away by saying that the alligators must have been attracted to the food dishes by the movement of the tortoises, and just accidentally eaten some lettuce. However, it is now a common sight to see the alligators at the tortoise bowls eating romaine lettuce and yellow squash. Sometimes the alligators even beat the tortoises to the dishes. We have had plenty of opportunity to record this behavior on videotape. There are several citrus trees in this mixed species exhibit. Occasionally, we have witnessed alligators running around with an orange or a lemon in their mouth, trying to keep it away from the other animals. It eventually gets chewed up or torn by other animals and swallowed. In March of this year, we watched as an American alligator raised itself into the lower parts of a small kumquat tree and grabbed fruit directly from the tree. In the course of a few minutes, we observed this same individual swallowing the fruit and going back for several more kumquats. In August 2002, some of our park visitors reported seeing an American alligator “sit-up” and remove a lime from one of the trees and proceed to chew it up and swallow it. We are not exactly sure why alligators in our park are eating their vegetables. It is possible that our animals, in captivity, are lacking something in their diet that makes them seek out vegetation. Or, is it possible that crocodilians deliberately consume vegetation as part of their normal diet?